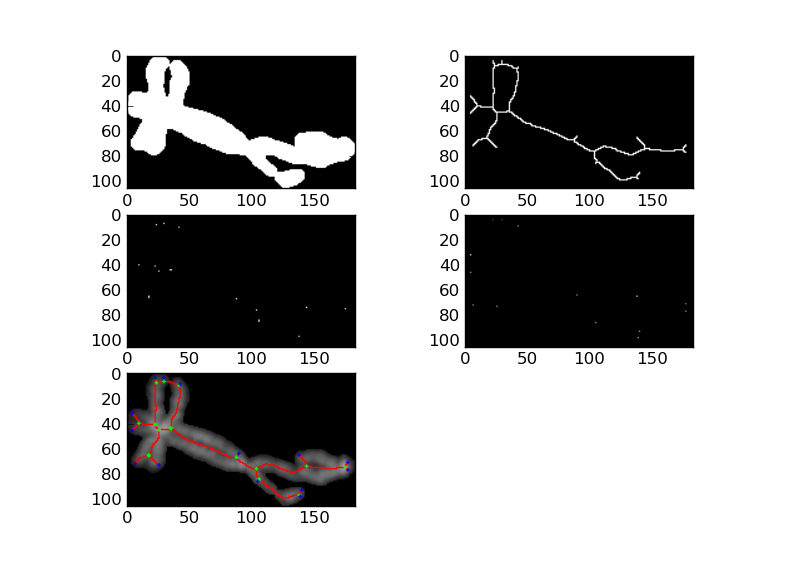 This blog is dedicated to Digital Image Processing for fluorescence in-situ hybridization and QFISH and other things about the telomeres. In order to detect overlapping chromosomes, or to analyse the shape of a chromosome it could be useful to analyse the shape of the particle skeleton. In the previous post hit-or-miss morphological operator, with the proper structuring element, detects branched points of a skeleton. Those points are indicated to classify overlapping chromosomes, even if pruning the skeleton might be necessary. Here, with other structuring elements, hit-or-miss operator detects the end points of particle constituted of overlapping and touching chromosomes. Targeting assay to study the cis functions of human telomeric proteins: evidence for inhibition of telomerase by TRF1 and for activation of telomere degradation by TRF2. thèse : Dynamique de la longueur des télomères au cours de la senescence et de l'immortalisation de cellules humaines. Jean-Patrick Pommier. Simple theme. Powered by Blogger.